Allenbach is the last town in the Idarbach creek valley before the road climbs up to the Idarwald main ridge towards Morbach on the other side of the ridge Here in Allenbach you reach the westernmost point of the "German Gem Road" This "Gem Road" connects the world-renowned jewellery centre Idar-Oberstein with many small villages where small gem cutting shops, powered by the streams of Hunsrück, worked precious stones and brought considerable prosperity. 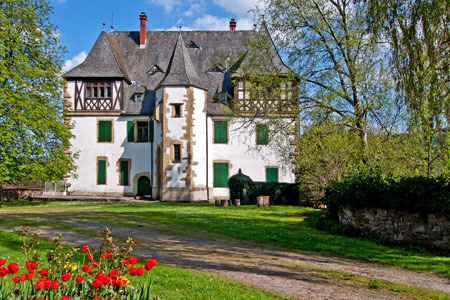 The castle and village of Allenbach were the property of the powerful Earls (American: Counts) of Sponheim from the lower Nahe Valley, who were closely connected to the Salic imperial family. During the 11th and 12th centuries, in the course of their territorial expansion, the Earls of Sponheim systematically constructed castles between the western borders of their land and the land of the Electors of Trier to establish the Western borders. Allenbach Castle was first documented in 1265 but is thought to have been built in the 12th Century. Together with the castle in Herrstein, it served the Sponheim bailiff ruling over the Seignories (feudal lordships) of Birkenfeld/Idarwald. Between 1223 and 1230, the Sponheim estate was divided between rivalling heirs and Allenbach became part of the back county. By 1528, the medieval main tower of Allenbach castle had been dismantled and an entirely new castle was built on the site in late Gothic and Renaissance style. Today's Allenbach Castle has prominent ashlar corners and boasts a striking, hexagonal stair-tower in the middle of the main facade. Around the turn of the century the main section of the Late Gothic half-timbering was replaced which led to the unfortunate loss of a number of the original shapes. However, this has not detracted from the attractiveness of this unique chateau. Allenbach lies in the climatically protected valley between Idarwald, Hochwald and Wildenburg ridges and is an ideal starting point for long walks or hikes through the vast stretches of pristine, unspoilt forests. For example, consider hiking over the crest of Wildenburg ridge to Ringskopf, with the Celtic refuge, dating from 200 B.C. (Latène Era). From there, go on to Kirschweiler Fortress and Silberich mountain. Alternatively, hike from Ringskopf, over the ridge down to the small forest road "Struthchaussee" which has a restored Gallic-Roman burial mound in the forested area "Kipp" above Siesbach. Return by way of the nature preserve, Hüttgeswasen, perhaps in combination with a side trip to the medieval pilgrimage church Heiligenbösch. This was built during the 12th and 13th centuries on the ruins of a Roman country villa. Walkers will undoubtedly wish to continue to Erbeskopf mountain, with its splendid view over the Hochwald and Idarwald mountain ranges. This is a breathtaking experience in any weather and at any time of year. It is also worthwhile hiking past Wirschweiler, over the Sensweiler Heights (734m) down to the moorlands with their unique flora and fauna, near the town of Morbach. These wetlands have formed in the undrained depressions of the mountain slopes and are fed by an abundant supply of spring water from the Idarwald heights ("Hangbrüche").